This activity showcases the vibrant culture and landscape of the summer capital of the Philippines, Baguio City through displaying their crafts and products. It promises to entice the people to enjoy gardening even in a fully-built-up area. 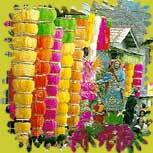 One of the most famous of Philippine festivals. Colorfully garbed and masked as Roman soldiers and centurions, locals reenact the life of Longinus culminating in his beheading. The entire towns of Boac, Morpog and Gasan are virtually converted into huge stages as the story as Longinus unfolds. The Carabao (kalabaw in Tagalog), is considered a national symbol of the Philippines. The Carabao Festival often features a colorful parade of 20 decorated bamboo sleds and a race among carroza-pulling carabaos on a 400-meter course. It is celebrated in honor of San Isidro, the farmer's patron saint. 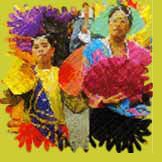 What makes the Obando fiesta unique among Philippine festivals? Childless wives perform the dance in the streets in their desire to share the fulfillment and happiness of motherhood! This is to honor Santa Clara, the patron saint of the childless, among others. The Parada ng Lechon, "parade of roasted pigs", is celebrated annually on the Feast of St. John the Baptist. Another practice of the villagers of this province, is to drench the paraders to signify the baptism of Jesus. This signifies a religious and spiritual purifying rite to the people of Batangas. Pintados is a derivation of the word "tattoos", that signify courage, rank and strength. The most anticipated aspect of the Pintados Festival is the parade of festive dancers painted from head to toe with designs that use astounding arrays of colors. 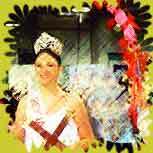 The biggest annual event that reflects the Bacoleños love for fun and gaiety. Coinciding with Bacolod City's charter day celebration, the festival features sports competitions, cultural programs, carnivals, beauty contest and a long Mardi gras style costumed and masked street dancers. The Philippines is the only Asian country that is predominantly Christian. Majority of its people are Roman Catholic. 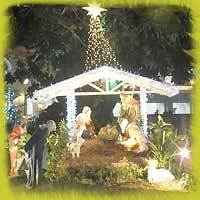 The Philippine Christmas celebration is said to be the longest and merriest celebration in the world. Misa de gallo, dawn masses celebrated with the first peal of church bells, are traditionally held starting December 16. Stories tell that in the 17th century, a priest combined Catholic rites with the farmers’ native thanksgiving to harvest gods before they start their day. This is followed by a hearty breakfast. One of the most popular of the Philippine festivals, the Ati-atihan is a celebration in honor of the Sto. Niño. Revelers don colorful costumes and paint their bodies black and dance to the distictive beat of "Hala bira!" around the town.